A complete range of robust pre-assembled irrigation and solar pump panel systems are available from ElectroMechanica (EM) for a wide range of pumping applications. “These solutions are designed not only to reduce energy costs, but also to conserve water and maximise productivity,” comments automation manager, William Cameron. 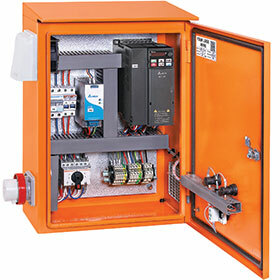 The pump panel systems are enclosed in weather-tight sheet metal enclosures that are available in various sizes, depending on the particular requirements of the installation. The uncluttered panel layout means there is sufficient working space in order to simplify installation, commissioning and servicing. Preconfigured VSDs reduce the energy drawn by the pump motor controlling the speed, while maintaining a constant pressure on the line. This is critical in terms of overall efficiency, as even a small reduction in speed results in significant cost-savings. Other standard features of the irrigation pump panels include a panel-mount isolator, drive and control circuit breakers, power and control terminals, manual off/automatic selector switch, run and trip indication, cooling fans and vents, and a rotary setpoint selector. Typical applications are irrigation, domestic water supply, fish farming, water livestock, solar-powered fountains, sprinklers, misters and soakers, ground dewatering for excavation, and construction sites. The standard features of the solar or photovoltaic pump panels include a multi-status indicator lamp, an on/off selector switch, DC fuse protection (including a spare), no-flow input and underload protection, and maximum power point tracking software and manual override. Cameron concludes that the niche irrigation and solar pump panel systems are aimed not only at diversifying into additional markets, but also to offer the full benefits of EM’s latest technology and products to the South African industry. The EtherCAT measurement modules from Beckhoff offer a right-fit solution by allowing high performance measurement technology to be incorporated directly into the control systems. Rockwell Automation has migrated the control systems at Mozal Aluminium’s furnace assembly and ladle cleaning shop to its modern DCS based on the PlantPAx design standard. System-integrated precision measurement technology for efficient machines and test benches. TwinCAT CNC automates dispensing system used in the automotive industry.